ZGroup was formerly creative and media AOR for the chain. Earlier this year, after Papa John’s received a wave of negative press over chairman John Schnatter’s comments regarding NFL protests and pizza sales and the brand moved to strip his image from its ads, he looked for a different opinion from longtime colleague Jordan Zimmerman, founder and chairman of the Omnicom agency that bears his name. According to sources with knowledge of the company’s thinking, Schnatter sought out Zimmerman on two fronts: providing advice on how to respond to accusations of racism on social media and convincing other members of the Papa John’s team to allow him to continue serving as the face of the brand. Three individuals confirmed that Schnatter and the Papa John’s marketing team met with Zimmerman at the agency’s headquarters in Fort Lauderdale, Fla. earlier this year while still engaged with agency partners Laundry Service, Olson Engage, Initiative and Fallon—all of which are no longer on the account. This meeting reportedly happened after Laundry Service upset Schnatter by proposing Kanye West as a potential brand spokesperson and days before the now-infamous media training call on which he admittedly used an ethnic slur. ZGroup, an entity that has been affiliated with Zimmerman, later produced a small group of ads starring Schnatter that ran in unspecified regions deemed friendly to the founder. One source who previously worked on the business said Laundry Service had no knowledge of these efforts until the ads aired. 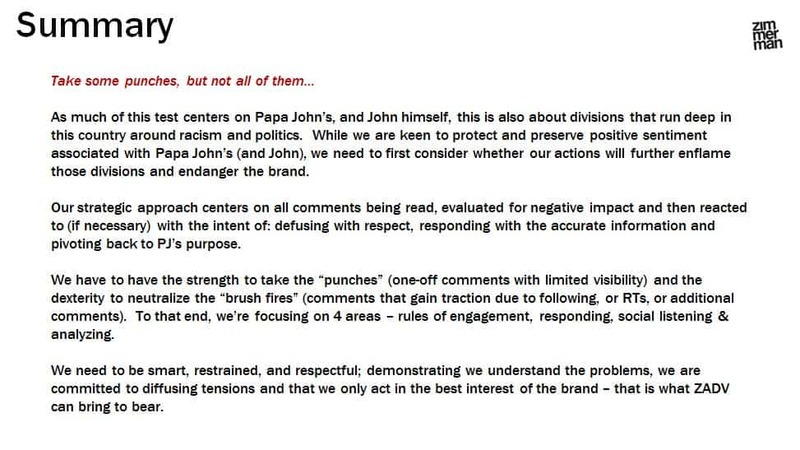 Adweek also acquired a deck, dated May 14, 2018 and titled “Addressing Negative Sentiment with Social Media: a POV for Papa John’s Media Test,” that detailed Zimmerman’s pitch; multiple parties confirmed its accuracy. Much of the document, which also drew from Zimmerman’s own research along with “transcripts and recordings provided by Papa John’s,” concerned whether to respond to tweets accusing the company and its founder of racism. 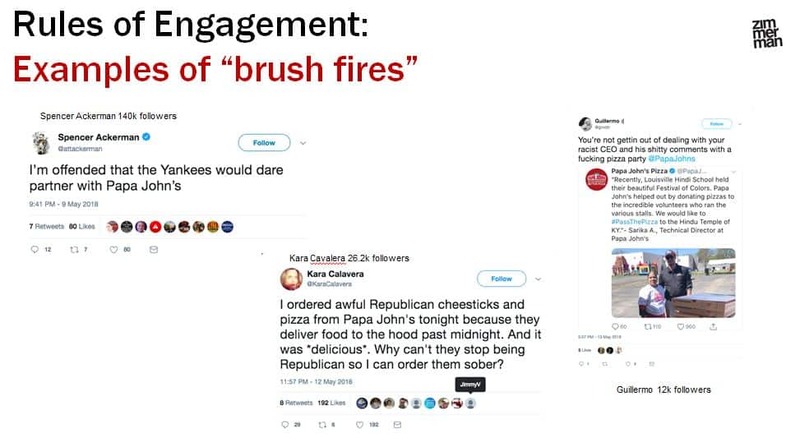 It placed these tweets into categories including “punches” and “brush fires,” with the former described as “short-form comments” with little or no context and the latter as larger issues requiring swift action. 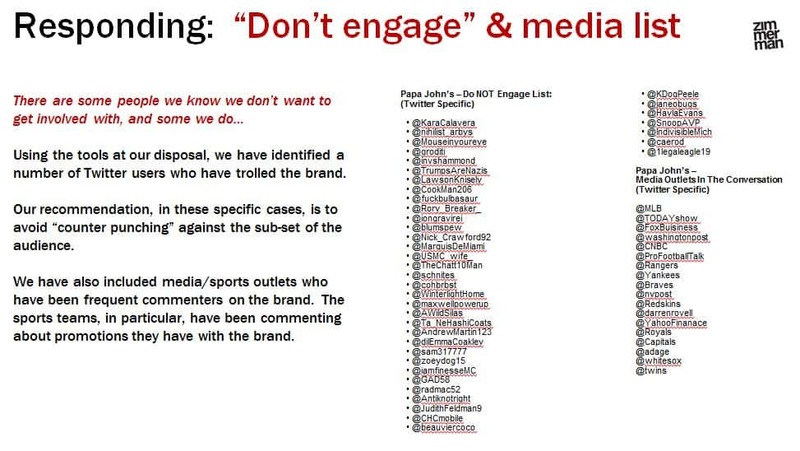 Generally, the deck advised the brand not to engage with detractors and included a specific list of Twitter users to avoid. One of these standard responses concerned the second service ZGroup provided to Papa John’s: the aforementioned regional ads. 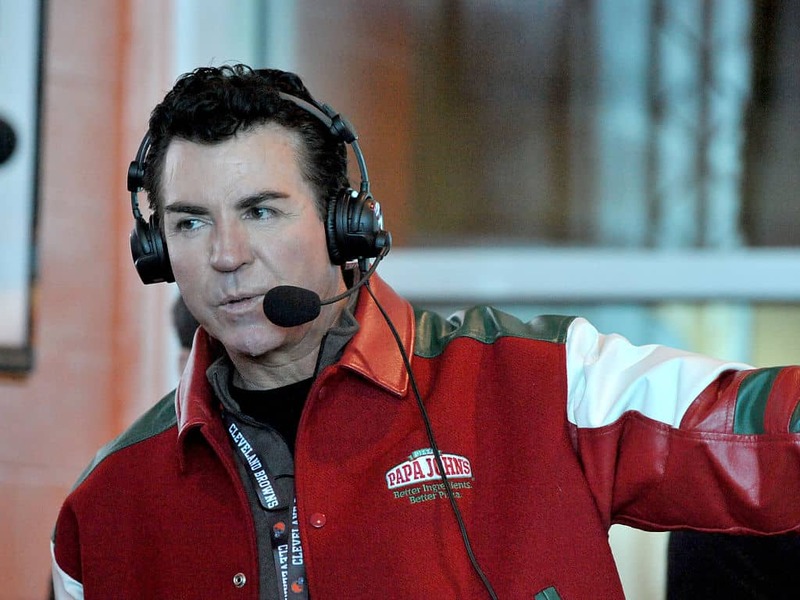 According to three individuals close to the business in recent months, the ads in question were created using pre-existing footage of Schnatter, and they stemmed from his insistence that Papa John’s hire an agency outside its existing roster to produce more spots starring himself. Members of the pizza chain’s marketing team disagreed, citing internal data that indicated persistently neutral or negative public sentiments toward the founder. Zimmerman reportedly argued that Schnatter’s renewed presence would help boost sales and provided market research to back up that claim. 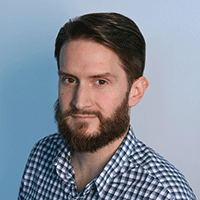 “The data was cut in that way, since Jordan just wanted to say what Papa wanted to hear in order to get the business,” one source claimed.